Things got real in this episode! The Hyperion plot has quite a bit going on. We have Henry getting a job offer to produce a podcast in New York because this podcast company liked his podcast about Hyperion Heights. HUH? Henry is a content creator so why would a podcast company want to hire him to produce? I mean yes this in keeping with Henry’s desire to want to have a story of his own BUT his podcast was about the residents of Hyperion Heights and their stories, so he still just in his author role. 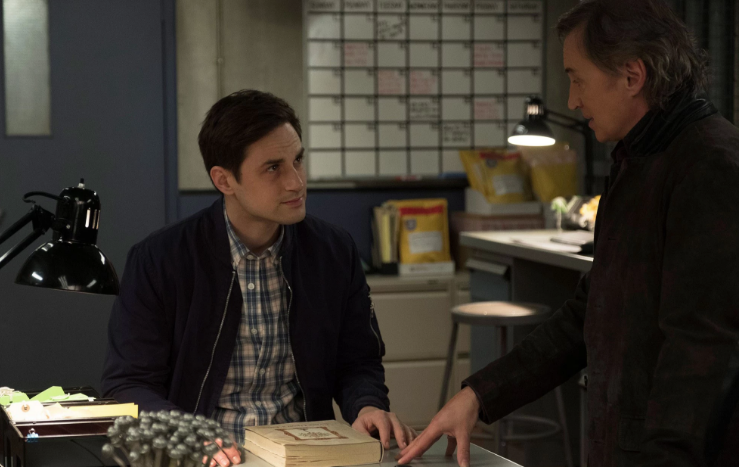 But whatever this plot point is in service to plot so it’s add drama to his dynamic with Jacinda but then Grandpa Rumple involves Henry on the case candy killer case. And is all seriousness, Henry and Rumple’s conversations are super touching. Say what you want about this season, It has redeem Rumple. Anyway Henry offers a break in the case because Hansel is a fan and Henry told all to Nick who is Hansel and he kidnaps Henry….. And sends a box of chocolates to Zelena a.k.a Kelly West, I see what you did there OUAT. Other plots involve Kelly and Margot’s not communicating and Tilly getting a job with Sabine, more Tilly and Margot bonding and Sabine and Rogers having more chemistry than Henry and Jacinda but everyone have more chemistry than those two so it’s not surprising. Quick question Nick has to know he’s not the Jacinda’s baby daddy right? I just thought of this, probably obvious to everyone else though but why is Henry Mills still Henry Mills? Everyone else has there second cursed name expect Lucy but she is more or less in the know but not Henry? So why does he have his original name? I’m so confused all the time! And then there the past section, which is another life changing field trip with Nook. Nook and Henry go on a adventure to fulfill Henry’s desire for his own story and get a pretty ring for Jacinda. Nook arranges a fake treasure hunt with with his frenemy Black Bread, seriously these two should get a spin off show. But then they get to real trouble when the sea wants the ring back. Henry learns that he’d rather have a life with Jacinda than impress her will daring due for his ego. OH THE SEXUAL IMAGERY in this part of the episode. There is a whirlpool that wants pirates (or sea men)… Henry straddles the mast and throws the shiney ring into a magic vortex to satisfy the whirlpool’s desire. Is my mind in the gutter or the imagery super strong here? Maybe I have been reading too many explicit Reylo fanfics, no I haven’t, you can’t read too many. The big question is and always shall be, How was this episode? It was fine, no glaring complaints. Henry’s in a pickle, Kelly is next on Hansel’s hit list, Jacinda is sad and Tilly and Rogers are awesome. Anyway things are moving towards the endgame. Regina was not in this episode. Doesn’t make it better or worse just pointing it out. Also I want to make a Zoolander Hansel joke but I shall refrain.